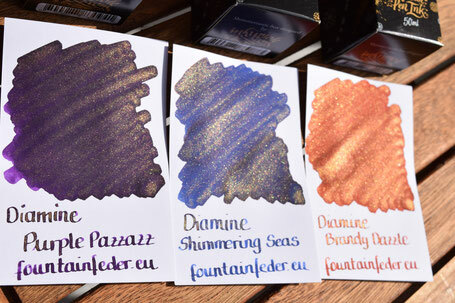 Diamine sure shimmers - fountainfeders Webseite! After returning from my business trip, I figured that I never did Inkswabs of the Diamine Shimmer inks we have in the shop. Since the sun was out, which is pretty rare in nothern Germany ;-), I decided to get right at it. I was so amazed by how much the shimmer. They shimmer even more than J.Herbin Emerald. I was so amazed that I put in an order right away to get the rest of the shimmertastic inks from Diamine. Can't wait for them to arrive. Update on the Organics Studio order is, that it finally shipped. I am all exited for it to arrive. Next week I will be leaving for a business trip as well, however Alper will be at home to take care of the shop. He is still working on his handwriting, so keep that in mind when receiving your order and reading the handwritten note ;-). I wish all of you a wonderful weekend. I enjoy a lot these stories. The inks in your shop are eye candy. Thanks for sharing!